A group of six researchers headed by Senior Research Associate of Structural Biology Lab Konstantin Usachev became one of the winners of this year’s RSF grants. 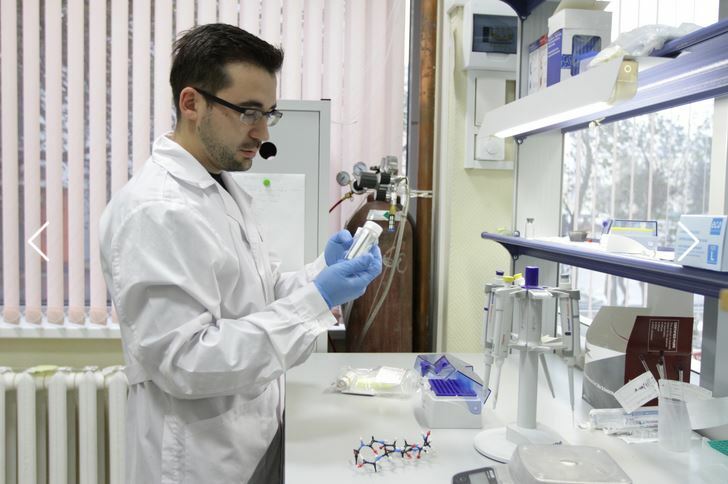 5 million rubles a year for three years will be allocated to this project titled “Structural and functional genetic analysis of the elongation factor P and the initiation complex of Staphylococcus aureus”. The Structural Biology Lab was established in 2014. This particular project is handled by six KFU employees and two colleagues from other institutions – one from the Institute of Protein Research (Pushchino, Russia) and one from University of Strasbourg. As Dr. Usachev explained, the project concentrates on studying the 3D structure of elongation factor P present in S. aureus. The factor helps ribosomes in synthesizing proteins with polyproline sections which are often the primary causes of virulence. Stopping such mechanism in cells can help eliminate them without affecting human cells. 3D visualization is the first step in creating potent antibiotics for this task. «Different organisms have variations in 3D structure of protein-producing cell mechanisms. Our basic idea is to find the differences in this 3D structure between Staphylococcus cells and human cells. After that, keeping in mind those differences, we can select antibiotics to work specifically against Staphylococcus. The medications must possess this high selectiveness in order to not affect human cells», explained Dr. Usachev. As is widely known, Staphylococcus aureus is one of the most dangerous bacteria today. Many strains have developed very strong antibiotic resistance and cause nosocomial infections resulting in deaths. Dr. Usachev estimates that protein synthesis studies will take three years, after which the work on an antibiotic can be started. The grant money will be used for lab supplies, salaries, and travel expenses for trips to research facilities in Germany and France.